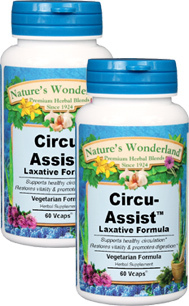 Circu Assist™ Laxative - 525 mg, 60 Veg Capsules each (Nature's Wonderland) - Penn Herb Co. Ltd.
Circu-Assist™ Laxative formula blends invigorating herbs & spices specifically to maintain healthy circulation plus Senna for the relief of occasional constipation. Senna… relieves occasional constipation and promotes healthy bowel function. Ginkgo…popular circulatory tonic supports blood flow throughout the body and promotes blood vessel health. Prickly Ash Bark…Native American bark boosts circulatory health. Cinchona, Gentian…traditional bitter tonics revitalize digestive functions and reinvigorate body systems. Supports healthy circulation, especially to the extremities; relieves occasional constipation; promotes healthy digestion. As an addition to the daily diet, take 1 or 2 capsules, 3 times daily with water at mealtimes. SEE LABEL FACTS BOX FOR CAUTIONS.